In January 2019, the Conservation Department took a party of secondary students to gather plastic that had washed up on the beach at Cave Point on Tristan's south coast. At 7:45am on Wednesday 30th January 2019, a total of 13 secondary students from St Mary's School, accompanied by two members of staff, assembled at Calshot Harbour. 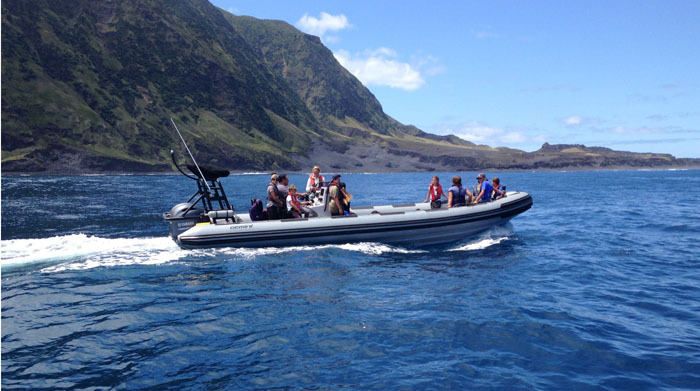 The students were met there by Kirsty, Cedric, George, Julian and Trevor from Tristan da Cunha's Conservation Department with their two RIBs, Arctic Tern and the as yet unnamed Blue Belt funded RIB. 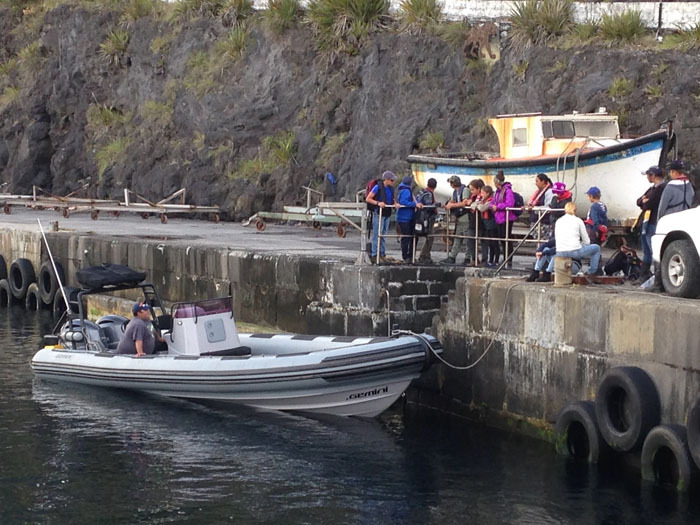 After boarding, the party travelled westwards around the island to Seal Bay, passing many of the island men fishing from their boats. 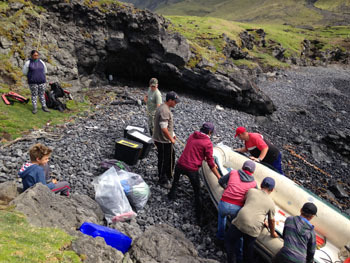 With Julian at the dinghy's helm, the students and Conservation Department staff were ferried ashore, skillfully aided during the landing by Cedric and Nathan so that most people remained dry. Landing at Seal Bay Pulling the dinghy away from the waves. 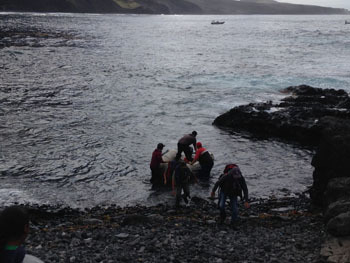 Following the landing, the dinghy was hauled high up the rocky beach, into a safe zone above the lapping waves, and left under the watchful eyes of a pair of moulting penguins. There was then a short amble over to The Pool side of Cave Point to the beach that required cleaning. 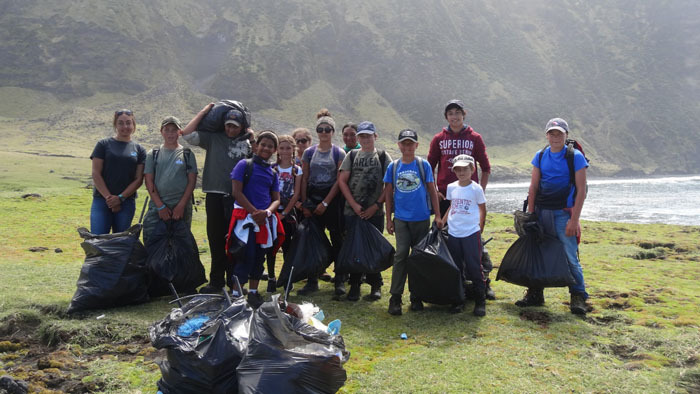 Working in teams of three, the St Mary's students quickly filled ten large black sacks with plastic rubbish that had washed ashore. 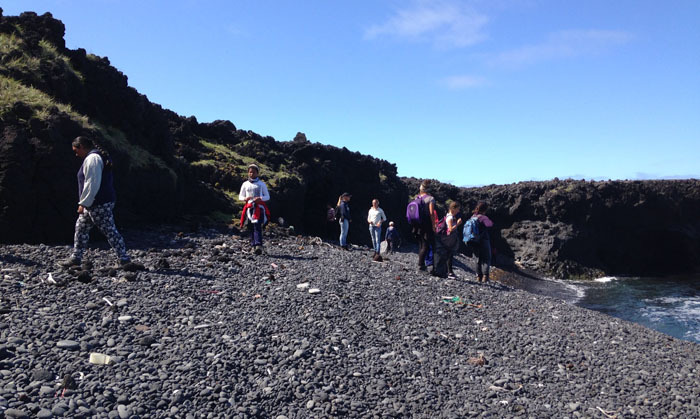 Students collecting rubbish from the shore. There were bottle-tops and brush heads, flip-flops and fenders, crates and children's toys, lighters and lengths of rope, pipes and plastic pieces of all colours and shapes. Lunch for most of the group was eagerly downed in the shadow of the radio antenna, sat amongst the huts, whilst watching the grazing cattle. The students with their haul of cleared rubbish. The return journey to the RIBs saw every member of the party wet to some degree and then the journey continued. We travelled eastward this time, passing Sailshardy Rocks, Trypot, Lyon Point and Sandy Point. All too soon the circumnavigation of the island was completed and as we arrived back in Calshot Harbour, thankyous and goodbyes were said. Homeward bound in a Conservation Department RIB.